The frigid temperatures send a chill down your spine. Only a few paces back, the moon glistened beautifully on the icy landscape. But now, you've traveled to the hidden recesses of Terror Mountain - a dark, shadowy place where the neither sun nor moon dare shine. "Crreeeeeaaaakkk..." a weathered brown door moans as another howling wind whips through. It's an old brown door - nearly destroyed by the many blizzards it's faced while protecting what lies behind it. And now, it's the last obstacle you must face. It's been a long and difficult journey, and this is the moment that you've been awaiting. "I only need to deliver a package," you confidently tell yourself, tightening your grip on the delivery under your cloak. "It'll be easy; I shall be in and out in no time." You inhale slowly - mustering every last bit of courage manageable - and knock once on the door. You try again with a bit more force. You try once more, afraid that if you knock any harder, the door might fall off its hinges. Finally, the door creaks open and a nearly toothless Yurble pokes his head out. He scans the shadows to make sure that you weren't followed, nods, then motions for you to follow him inside. He points to a table near the fireplace. Denizens of the small lodge glare as you make your way to the seat; not that it matters much, the only thing on your mind at the moment is warming yourself by the fire. A shadow Grarrl, wearing a red bandana with a large scar over his left eye approaches. "Who might you be?" he growls. You can feel his warm, foul breath grace the back of your neck, and try not to falter, "It does not concern you..."
"Oh really..." He flashes a small, but deadly knife before your eyes. It glows orange in the light of the fire. A few others join and soon a whole room of knives stands before you. With such brash behavior, almost anyone would have mistaken these Neopians as commonplace pirates, who just happened to be quite far from the seas of Neopia. Lucky for you, you have years of knowledge under your belt, and are now sitting in the legendary Thieves Guild. "Enough!" a voice yells. "You're lucky I don't send all of you to Fyora, myself." The room parts immediately, revealing the Yurble from before and blue Gelert, wearing a purple cloak. With a wave of his hand all of the thieves immediately returned to their previous activities. "You have my sincerest apologies for the crude behavior of my associates. My name is Kanrik. I have been expecting you." He takes the seat across from you and the fire illuminates his battle-tested face. Your eyes grow wide as you hear Kanrik's last statement, "My letter mentioned nothing of my visit." "Ah, so my network of spies is much faster and efficient than you expected. I knew about your arrival quite awhile ago. But enough chit-chat, we are here for business, are we not?" "Yes, about that." Kanrik danced his blade through his fingers. "Now that war is inevitable, my guild needs increased funding and immeadiate." "What?! But- but- the amount we negotiated through my letter was nearly outrageous!" "Yes, and now we need more." "You didn't even hold up your end of the bargain! Somehow your magnificent 'Network of Spies' got word around to five other factions!" Before you can blink, Kanrik's stiletto is sitting squarely between your eyes. "My company reached the site twenty-four hours before the pompous, whig-wearing Sway! Did you honestly not believe that no one was going to notice a giant stone in the middle of Tyrannia?! We've had much more time to prepare than the other factions... but that comes with a cost..."
"And what if I refuse?" Bravado resounds through your shaky voice. "We can have matching scars - and discuss - or we can just discuss - your choice." Your eye twitches at the thought. "But I am perfectly open to negotiation!" "That's what I thought." Karnik smirked, returning his blade to his belt. "You should be quite glad you hired us for your – how should I put it? – special mission?" You nod, "And preparation is going well, I presume." "Of course." Kanrik nods, "I shall give you a run-down of the current situation. It all began a week ago, after the earthquake in Tyrannia, as you already know. Any huge events are just one big party for us thieves. We disguised ourselves as normal diggers, just looking for a chance to strike it rich; when in actuality we were finding quite easy pickings of off unsuspecting tourists and actual diggers. An activity that was trivial to the Sway, and un-motivating to The Order of the Red Erisim, The Brute Squad, the Seekers, and the Awakened. So naturally when the obelisk as uncovered, we were the first to know about the finding - also when you contacted us. 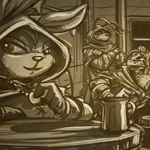 But, we had to slow the others down, at least until the entire Thieves' Guild could be mobilized. We knew we had to work quickly; we couldn't hide from the Sway's Crokabeak spies or the Order's magic for long. We came up with a plan - a hideous, heart-wrenching, disgusting plan, and it managed to hold off our opponents for days. With more time to prepare, the Thieves' Guild is assured a quick, easy, and definite win for the control of the obelisk." "And that's when you enact my part of the deal?" "Presuming you have payment for both that and for war expenses..."
"May I ask what that 'hideous, heart-wrenching, disgusting plan' you mentioned was?" "I'm afraid to disappoint you... but it's a secret – for now, anyway." Afraid to press further you simply nod, and remove a small pouch hidden under your cloak and dump the contents onto the table. "Click, Click, Click," each of the rare jewels pleasantly sang as it tapped on the table. Members of the guild couldn't resist watching the precious stones dance in light of the fire. 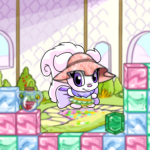 "That must be at least one million Neopoints worth..." one whispers. "I hope this covers it..." You can't help but smile at Kanrik's and the guild's looks of surprise. "That should certainly cover it all." "Good." You then remove the small package that you had been carrying under your arm. "Now your job is to deliver this into the obelisk – any treasure, knowledge, power or whatever else these factions care about is yours for the taking. I only need this to be placed inside of it – the sooner, the better." "Of course. I can arrange for it to be completed as soon as possible. Valin the Quick did not earn his name for doing nothing; he shall slip in and out in the blink of an eye." "Excellent." You smile, knowing that everything is perfectly falling into place. "I shall be taking my leave, now. I trust that you can handle everything from here." Outside, temperatures have fallen even lower than before. 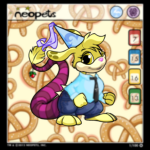 It's too cold for neither Neopet nor Petpet – not even the joyous lights of Happy Valley can be seen; only a long walk over a barren, icy wasteland in sub-zero temperatures lies ahead. But, the thought of that doesn't occur to you. Your mind is filled with narcissistic thoughts of your now greatest accomplishment, as you fly across the frigid snow. Your minded is so filled that you don't notice that the door has locked shut behind you or that both your socks and shoes have mysteriously disappeared. "I – I – I- outsmarted the Thieves Guild!" you taste each word as it dances off your lips. "They fell for my almost perfect replicas of precious stones... and now that package. Oh yes, the cake! With the cake in the obelisk, I shall be able to control the Awakened! And I – oh yes! – I shall control Neopia!" Kanrik gathered the gems, put them in a pouch, and tossed it into the fireplace. Guild members ran to try to save their burning wealth. "What are you doing?!" another demanded. "Fake." A disinterested Kanrik spun his stiletto through his fingers. "They were easily noticeable. I'm surprised you couldn't tell from across the room." "An attempt to trick the Thieves' Guild?! Why did you let her leave?" "Don't worry, our deceiver won't be getting far," Kanrik sneered. "I simply enacted our plan once more – it stalled some of our fellow competitors for days." He held out a pair of socks, "In this weather, it will take Fyora's magic to save our deceiver's feet from freezing, leaving her stuck in the middle of a blizzard." "Foolish enough to play The Thieves Guild... you have guts, I'll admit." Kanrik smiled as he shook his head, then opened the package he'd recieved. "Cake anyone?" If the winter blues have hit you hard, consider these tips to regain your health and confidence!